Throughout my professional career as a computer programmer, I have often presented demos, findings and data analytics to a variety of audiences. Both internally to other staff, and to customers in meetings and special events. Recently, I have begun public speaking, delivering technical talks and insights to interested parties. I am co-organiser of both Dot Net North in Manchester and Macc Tech in Macclesfield. I have personally spoken at both of these meetups / user groups, and at other events too, such as Xamarin Dev Days. 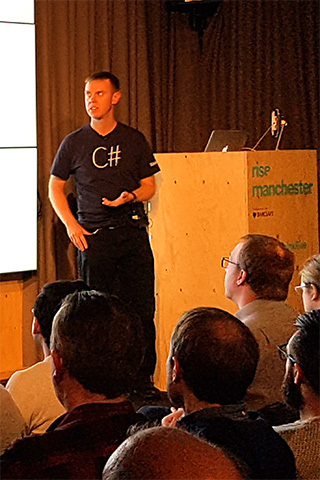 Please get in touch if you are interested in learning more, have an interest in one of my past talks, or would like to ask me to speak at your event. If you prefer, please engage with me on LinkedIn or Twitter. My experience is vast, covering C#, web development, mobile apps, and cloud. Macc Tech: Yammer, Do Testers Think Differently?